LONDON--(BUSINESS WIRE)--The latest market research report by Technavio on the global electric car rental market predicts a CAGR of around 11% during the period 2017-2021. 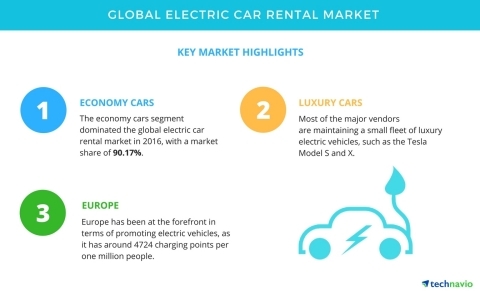 The report segments the global electric car rental market by vehicle category (economy cars and luxury cars), and by geography (the Americas, EMEA, and APAC). It provides a detailed illustration of the major factors influencing the market, including drivers, opportunities, trends, and industry-specific challenges. Increasing demand for rental cars due to rise in international tourism is one of the major factors driving the global electric car rental market. The growth of international tourism is critical for the growth of the rental vehicle industry. In 2016, the tourism industry witnessed a healthy growth. It has been seen that tourists mostly opt for rental cars instead of tourism services to explore a place. The main reasons behind choosing a rental car over taxis and tourism services are privacy, along with safety and freedom. Also, rental cars are a more cost-effective alternative to taxi services. Technavio researchers anticipate high growth for the global electric car rental market in EMEA due to the long-term commitment toward promoting electric vehicles by the European government. To increase employment and economic growth, the European Commission has introduced various initiatives, particularly aimed at promoting sustainability, accessibility, culture, and at boosting low season and coastal tourism. Electric car rentals were one of the businesses that supported the sustainability initiative. The global electric car rental market is highly competitive and has the presence of many well-established vendors. However, most of the competition comes from the car rental companies managed by the unorganized sector. In addition, the market is mostly dominated by region-specific players rather than global players. The major vendors are investing immensely in setting up charging infrastructure to make the electric vehicle rental feasible. Access Technavio’s continuously growing automotive services research library and find expert analysis on hundreds of markets. The latest market research report by Technavio on the global electric car rental market predicts a CAGR of around 11% during the period 2017-2021.